Before what we know as prisons came into being the United States penal system was comprised of penitentiaries. The prevailing principle underlying the concept of the penitentiary was to place convicts in an environment that was conducive to contemplation. Being reasonable folks (and the operative here is reason), these ne’er do wells would eventually understand the error of their ways and become model citizens ready for reintegration into decent society. I mention the previous because I too am a penitent. But instead bars my place of contemplate runs sporadically on four measly cars. Yes, I am talking about the G train. After all, how else can one while away so much time without touching upon a little existentialist angst? Seriously? 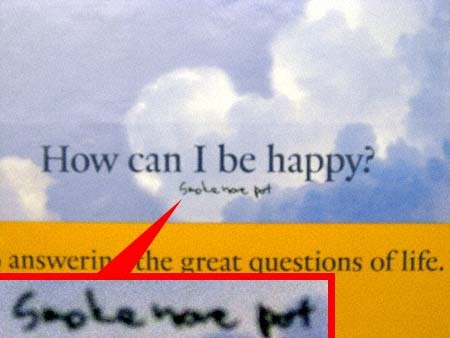 Which brings me to this poster for Philosophy Works. 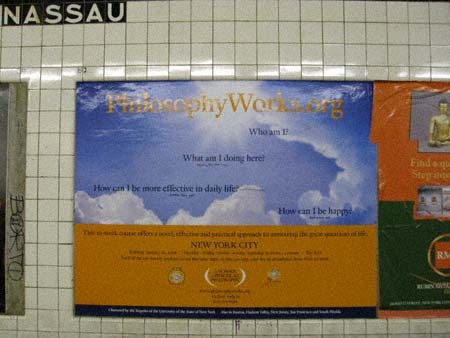 As is the case with advertisements hawking philosophy, it asks a lot questions. 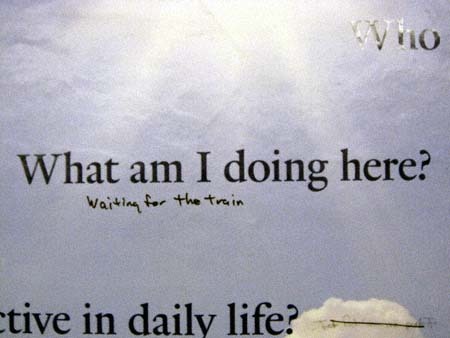 Little did its creator know that we G train patrons have already found the answers. Waiting for the mighty Crosstown Local to work its way through the bowels of Brooklyn and Queens predisposes us to reassess our lifestyle choices. Sometimes we even feel a little guilty about some of them. Heather is an excellent writer… she has the best blog on the net! 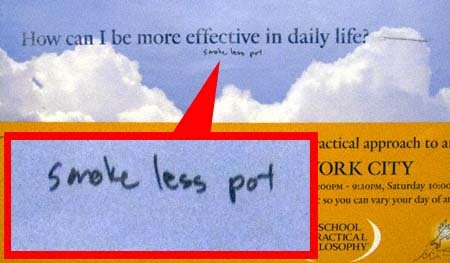 Can’t we all just smoke more pot?